Italian priests have declared their willingness to “open the church doors of every single parish” to people expelled from reception centres as an anti-immigration law from Italy’s rightwing government threatens to make thousands homeless. 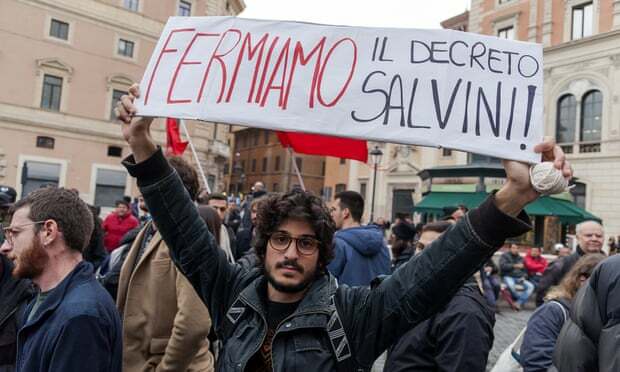 The so-called “Salvini decree” – named after Matteo Salvini, the interior minister and leader of the far-right League – left hundreds in legal limbo when its removal of humanitarian protection for those not eligible for refugee status but otherwise unable to return home was applied by several Italian cities soon after its approval by parliament earlier this month. The Catholic church expressed its profound disapproval immediately after the vote. According to Italy’s ministry of the interior, between 2016 and 2017 Italy provided humanitarian protection to 39,145 asylum seekers, who under the Salvini decree risk being made homeless within weeks. In early December, a letter announcing the expulsion of 50 people was sent to the reception centre in Mineo, Sicily: the largest in Europe after the Moria camp in Greece. The bishop of Caltagirone, Monsignor Calogero Peri, said he was prepared to provide 40 beds in nearby facilities owned by the church to welcome people who risk expulsion. “And if there are not enough beds? I have already spoken with other bishops: we will open the church doors of every single parish under our control,” he said.